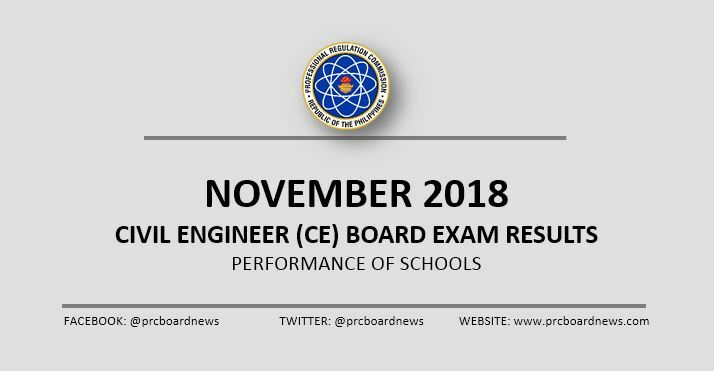 MANILA, Philippines - The Professional Regulation Commission (PRC) recognizes the top performing schools in the November 2018 Civil Engineering (CE) board exam on Thursday, November 15 or in four (4) working days after the exam. University of the Philippines - Los Baños (UPLB) dominated the schools with 98.63% or 72 out of 73 passed the exams. It was followed by Carlos A. Hilado Memorial State College - Talisay with 96.08% or 49 out of 51 passed. PRC administered the Civil Engineering licensure exam in the cities of Manila, Baguio, Cagayan de Oro, Cebu, Davao, Iloilo, Legaspi, Lucena, Tacloban, Tuguegarao and Zamboanga on November 10 and 11, 2018. In the November 2017 CE board exam, University of the Philippines (UP) - Diliman led the schools with 97.41% or 113 out of 116 passed. UP-Los Baños (UPLB) followed with 96.55% or 56 out of 58 passed. In the November 2016 Civil Engineer exams, UP - Diliman dominated the schools with 96.08% or 98 out of 102 passed the tests. UP-Los Baños (UPLB) came in second with 95.16% or 59 out of 62 passed. Hey!! Shouldn't Pamantasan ng Lungsod ng Maynila be the first school in the ranked since they had just a 100% of passing rate?/ Higher than UP Los Banos? ?